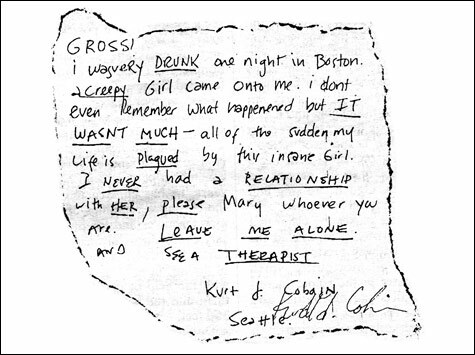 I guess Kurt didn’t think much of Mary Lou Lord…Kurt Cobain and Courtney Love sent this fax in 1993 as a response to a profile that appeared in a magazine about Mary Lou Lord and her brief but intense relationship with Kurt around the time that Nevermind came out. But Everett True’s Nirvana: The Biography confirmed that for a time Kurt was telling people how in love he was with Mary Lou, and even dreaming about moving to Boston to be with her. That letter was written by Courtney Love. All the rumors were spread by Courtney Love. It is Courtney who was obsessed with Mary Lou. Kurt and Mary Lou were together — boyfriend and girlfriend. That was genuine. While Mary Lou was on tour, Courtney seized the moment and told Kurt all these terrible things about Mary Lou. Mary Lou found out and didn't think Kurt would take them seriously because they were so ridiculous and she figured he knew her well enough to know that they were not true. She was wrong. Courtney somehow convinced Kurt, or he was just too shy to speak for himself and that was the end of Kurt and Mary Lou. Mary Lou was devastated. For a long, long time.